It's extremely easy to get caught up in self-deprecating speech and negative thoughts, particularly when it's so prevalent. 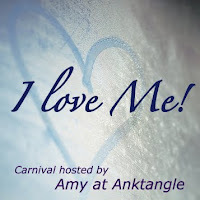 That's why I had the idea to host this blog carnival: why not have a day where instead of comparing all our flaws, we all celebrate the awesome things about ourselves and each other?! Introducing: I Love ME! The lift yourself up, just for being you carnival. What's a blog carnival, anyway? A carnival is an opportunity for writers to come together to write about a specific theme on the same day. On carnival day, you get to read everyone else's take on the theme, and they read yours! I'm a big fan of participating in blog carnivals. They're a great way to meet new people, read incredible content, and even promote your blog a little bit all in one day. It's my hope that through the I Love Me! carnival, we can all boost ourselves (and each other) up a little bit. Choose a body part or personality trait that you're sometimes critical of yourself about, and challenge yourself to write about all the things you love and appreciate about that part of yourself. Tell us how you model love of self for your children, or how you've seen this modeling pay off in their lives. Take us through a ritual or practice you have that helps you treat yourself with love and respect. Compose a poem or love letter to yourself, telling you why you're so incredible and worthy of love! Share photographs of things you love about yourself (these could be physical characteristics, qualities you possess, or skills you have—think big!). Think about the hold-ups you have about loving yourself unconditionally, and tell us what steps you're taking to overcome those obstacles. Deadline for submissions is Friday, October 21st at 11:59 PM Pacific Time. Before carnival day, I'll send an email to all participants with some html to copy and paste into the top and bottom of your post. I'll also send out a list with everyone's blog homepages, Facebook fan pages, and Twitter names (if you share them with me in the form), so we can start to get to know each other a little better. Carnival day will be Friday, October 28th. On that day, you'll publish your article and read and comment on posts from the other carnival participants. It's that easy! Whether or not you plan to participate in the carnival please feel free to grab the carnival button and put it in your blog sidebar. It's a great way to tell everyone that you're proud to say it: I Love ME! Many thanks to Shandi-lee for the beautiful photograph. I can't wait to see you all on carnival day! Sounds like an incredible blog carnival. I'm in! Looks like a fun carnival to participate in. I'm assuming that I can write about anything? I thought of a topic already and it's about a characteristic of mine, not about body-image. I love this idea! I'll post a link to this post on my blog's FB page to encourage my readers to participate too! Love this idea! I'm in! Need to boost up my morale a bit since I'm still struggling with my tandem nursing now. I'm so glad you're all going to be a part of this!